TLJ Daily E-Mail Alert No. 655, May 5, 2003. May 5, 2003, 9:00 AM ET, Alert No. 655. 5/1. Sen. John Ensign (R-NV), Sen. Barbara Boxer (D-CA), and other Senators introduced S 979, the "Broad-Based Stock Option Plan Transparency Act of 2003''. 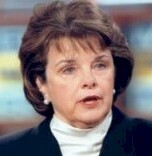 Sen. Dianne Feinstein (D-CA) (at right) stated in the Senate that "It is important that we do not react to the corporate scandals of last year by stifling this vital tool for economic growth. It would be bad for the economy, bad for workers in this country, and bad for potential investors." See, Congressional Record, May 1, 2003, at page S5671. 4/28. Sen. Richard Lugar (R-IN) introduced S 925, the "Foreign Relations Authorization Act, Fiscal Year 2004 ", a bill to authorize appropriations for the Department of State for fiscal year 2004 and for the Peace Corps for fiscal years 2004 through 2007. This is a huge bill; only a few sections are technology related. See, Section 111 pertaining to "International Broadcasting Activities" and Section 810 pertaining to the "Middle East Broadcasting Network". See also, Section 612 pertaining to the "Expansion of Educational and Cultural Activities" which provides, "BRIDGING THE DIGITAL DIVIDE -- The Secretary is authorized to establish a program to help foster access to information technology among underserved populations and civil society groups in eligible countries." The bill was referred to the Senate Foreign Relations Committee. 5/1. Rep. Kenny Hulshof (R-MO) and Rep. Xavier Becerra (D-CA) introduced HR 1927, a bill to amend the Internal Revenue Code to include wireless telecommunications equipment in the definition of qualified technological equipment for purposes of determining the depreciation treatment of such equipment. The bill was referred to the House Ways and Means Committee. See also, S 895, an untitled bill, and HR 1232, the "Technology Investment Incentive Act of 2003". 5/1. Rep. Jerry Kleczka (D-WI) and others introduced HR 1931, a bill to protect the privacy of the individual with respect to the Social Security number and other personal information. It was referred to the House Ways and Means Committee. 5/1. Rep. Doug Ose (R-CA), Rep. Mike Thompson (R-CA), and Rep. Butch Otter (R-ID) introduced HR 1940 [14 pages in PDF], the "Medicare Telehealth Validation Act of 2003". The bill would expand Medicare reimbursement for telehealth technology, and authorize the appropriation of $40 Million for the development of telehealth networks for rural communities. See also, statement by Rep. Ose. The bill was referred to the House Commerce Committee and the House Ways and Means Committee. 4/30. The Senate passed S 196, the Digital and Wireless Network Technology Program Act of 2003, by a vote of 97-0. See, Roll Call No. 136. The bill would create a new office at the National Science Foundation (NSF) named the Office of Digital and Wireless Network Technology (ODWNT). The bill would also authorize the appropriation of $250,000,000 for each of the fiscal years 2004 through 2008 for grants to be administered by this new office. Grants could be used "to acquire the equipment, instrumentation, networking capability, hardware and software, digital network technology, wireless technology, and infrastructure". Grants could also be used "to develop and provide educational services, including faculty development, related to science, mathematics, engineering, or technology". Grants could also be used to provide teacher training, and to "implement joint projects and consortia to provide education regarding technology". Grants could also be used to "to provide capacity-building technical assistance to eligible institutions through remote technical support, technical assistance workshops, distance learning, new technologies, and other technological applications". Sen. George Allen (R-VA) (at right), the sponsor of the bill, stated in the Senate that "since 1996, the number of bachelor degrees awarded in the physical sciences has dropped 29 percent, mathematics is down 19 percent, and engineering is down 21 percent." He continued that "information technology companies are still relying on H-1B visas and using foreign workers to fill important IT jobs and positions. I want to be clear that I am not against legal immigration, but I say let's properly educate and train Americans so they can get those good high-technology jobs. Now, minority-serving institutions, when one looks at them, still lack desired information and digital technology infrastructure in many cases." The House has not yet passed the bill. See also, story titled "Senate Committee Approves Technology Grant Program for Minority Serving Institutions" in TLJ Daily E-Mail Alert No. 623, March 14, 2003, and story titled "Sen. Allen Introduces Bill to Create Technology Grant Program for MSIs" in TLJ Daily E-Mail Alert No. 586, January 20, 2003. 4/29. The Senate confirmed Jeffrey Sutton to be a Judge of the U.S. Court of Appeals for the Sixth Circuit by a vote of 52-41. See, Roll Call No. 135. The vote broke down along party lines. All of the votes in favor came from Republicans, except that Sen. Ben Nelson (R-NE) also voted in favor. All of the votes against came from Democrats. The Democratic presidential candidates -- Sen. Joe Lieberman (D-CT), Sen. John Kerry (D-MA), and Sen. Bob Graham (D-FL) -- did not vote. 5/1. The Senate rejected a cloture motion to end the Democrats' filibuster of the nomination of Judge Priscilla Owen to be a Judge of the U.S. Court of Appeals for the Fifth Circuit by a vote of 52-44. See, Roll Call No. 137. Under Senate Rule 22, a cloture motion requires a super majority of 60 votes to pass. The vote broke down along party lines. However, Sen. Nelson and Sen. Zell Miller (D-GA) voted in favor, and Sen. Lieberman and Sen. Graham did not vote. 5/1. The Senate confirmed Edward Prado to be a Judge of the U.S. Court of Appeals for the Fifth Circuit by a vote of 97-0. See, Roll Call No. 138. 4/28. President Bush nominated Claude Allen and Allyson Duncan to be a Judges of the U.S. Court of Appeals for the Fourth Circuit. Allen is the Deputy Secretary of Health and Human Services (HHS) at the Department of HHS. Before that he was the Secretary of Health and Human Resources for the Commonwealth of Virginia. Duncan is a partner in the Raleigh, North Carolina, office of the law firm of Kilpatrick Stockton, and President Elect of the North Carolina Bar Association. She was previously a judge on the North Carolina Court of Appeals. She was also Executive Assistant to Justice Clarence Thomas when he was Chairman of the Equal Employment Opportunity Commission. See, White House release. 4/28. President Bush announced his intent to nominate Michael Fisher and Judge Jay Waldman to be Judges of the U.S. Court of Appeals for the Third Circuit. Fischer is Attorney General of Pennsylvania. Waldman is a Judge of the U.S. District Court for the Eastern District of Pennsylvania. See, White House release. 4/28. President Bush announced several nominations to the U.S. District Court: Robert Brack (District of New Mexico), James Browning (District of New Mexico), Glen Conrad (Western District of Virginia), Robert Conrad (Western District of North Carolina), Mark Filip (Northern District of Illinois), Kim Gibson (Western District of Pennsylvania), Dora Irizarry (Eastern District of New York), Brent McKnight (Western District of North Carolina), Daniel Ryan (Eastern District of Michigan), Gary Sharpe (Northern District of New York), and Lonny Suko (Eastern District of Washington). See, White House release. 4/28. Monday, April 28, was the deadline to submit reply comments to the Federal Communications Commission (FCC) in response to its Further Notice of Proposed Rulemaking (FNPRM) regarding a proposed set of rules pertaining to "plug and play" cable compatibility. On December 19, 2002, fourteen consumer electronics companies and seven cable operators announced that they entered into a Memorandum of Understanding (MOU) regarding a national plug and play standard between digital television (DTV) products and digital cable systems. See, document [78 pages in PDF] consisting of the MOU, proposed rules to be promulgated by the FCC, and a letter to FCC Chairman Michael Powell and others. See also, FCC release [MS Word] of January 7 announcing the FNPRM, and notice in the Federal Register, January 16, 2003, Vol. 68, No. 11, at Pages 2278 - 2283. This is CS Docket 97-80, and PP Docket 00-67. See, for example, reply comments [32 pages in PDF] submitted by the Consumer Electronics Association (CEA), reply comments [21 pages in PDF] submitted by the Motion Picture Association of America (MPAA), reply comments [68 pages in PDF] submitted by the National Cable & Telecommunications Association (NCTA), reply comments [22 pages in PDF] submitted by the Comcast, reply comments [PDF] submitted by the National Music Publishers Association (NMPA) and others, reply comments [PDF] submitted by the Philips Electronics, and reply comments [18 pages PDF] submitted by Veridian Corporation. And see, reply comments [PDF] submitted by the Home Recording Rights Association (HRRA), reply comments [HTML] submitted by thePublic Knowledge and Consumers Union, and reply comments [8 pages in PDF] submitted by the Consumer Federation of America (CFA). See also, story titled "FCC Seeks Comments on Cable TV Plug and Play MOU" in TLJ Daily E-Mail Alert No. 581, January 13, 2003. 5/1. The Copyright Office (CO) published a notice in the Federal Register requesting public comments on "proposed regulations that set rates and terms for the use of sound recordings in eligible nonsubscription transmissions for the 2003 and 2004 statutory licensing period, and for the use of sound recordings in transmissions made by new subscription services from 1998 through December 31, 2004, in addition to the making of ephemeral recordings necessary for the facilitation of such transmissions." The deadline to submit comments is June 2, 2003. See, Federal Register, May 1, 2003, Vol. 68, No. 84, at Pages 23241 - 23249. 5/2. The Department of Justice's (DOJ) Antitrust Division released its Evaluation [19 pages in PDF] recommending that the Federal Communications Commission (FCC) approve Qwest Communications' Section 271 application to provide in region interLATA service in the state of Minnesota. Hewitt Pate, the Acting Assistant Attorney General in charge of the Antitrust Division stated in a release that "The available evidence suggests that generally, Qwest has succeeded in opening its local telecommunications markets in Minnesota ... Competitors, particularly those using entirely their own facilities, have made progress in penetrating the business and residential markets in the state, and the Department believes there are no longer any material obstacles to residential competition using unbundled network elements created by Qwest." See also, Qwest release. 5/1. Rep. Maurice Hinchey (D-NY) introduced HRes 212, a resolution pertaining to the Federal Communications Commission's (FCC) media ownership proceeding. It states that "the FCC should not weaken any current media ownership rules that protect people's access to diverse sources of information", and that "the FCC should allow for extensive public review and comment on any proposed changes to current media ownership rules before issuing a final rule". He also spoke in the House regarding this resolution. See, Congressional Record, May 1, 2003, at page H3538. 4/30. A group of musicians wrote a letter to Federal Communications Commission (FCC) Chairman Michael Powell regarding the FCC's media ownership proceeding. The group wrote that "We are writing to insist that Congress and the public have a full opportunity to review and comment on any specific changes that the Commission intends to make in the biennial review of media ownership rules before such rules are issued in final form." They added that "As musicians, recording artists, citizens and small business owners we are uniquely qualified to comment on the increased consolidation of the radio dial since the passage of the 1996 Telecommunications Act. We write to you today to emphasize that this period of consolidation has had far-reaching negative repercussions on our ability to gain access to the public airwaves and to make a living." Many of the signatories of the letter are aging rockers long past the peak of their popularity, such as Jackson Browne, Jimmy Buffett, David Crosby, Neil Diamond, Stevie Nicks, Tom Petty, Billy Joel, and Patti Smith. 4/30. A group of academics wrote a letter [MS Word] to Federal Communications Commission (FCC) Chairman Michael Powell regarding the FCC's media ownership proceeding. They wrote that, "According to reports, the Commission is developing a "diversity index" that will serve as a form of universal measurement on media ownership. Such a measure, we understand, will be used to analyze individual media markets in order to determine whether cross-ownership limits should be eliminated, modified, or maintained." The added that "We have grave doubts that any single measure can effectively analyze the complexities of the media marketplace, in terms of its impact on journalism, citizen access to information, and competition." They also urged the FCC to "release to the public any proposed such measures in advance of their enactment." The mail servers of several law firms and companies sent messages to Tech Law Journal on May 2, 2003 stating that they blocked delivery of Friday's edition. The story titled "Bush Signs PROTECT Act" caused some mail servers to determine that this edition constituted "spam", "sensitive content", or "sexual discrimination". If you have not yet received Friday's edition, it has been published in the TLJ web site. See, TLJ Daily E-Mail Alert No. 654. The House will meet at 2:00 PM in pro forma session only. See, Republican Whip Notice. The Senate will meet at 12:00 NOON. At 12:45 PM it will take up the nomination of Deborah Cook to be a Judge of the U.S. Court of Appeals (6thCir). After that, Senate Democrats will continue their filibuster of the nomination of Miguel Estrada to be a Judge of the U.S. Court of Appeals (DCCir). 8:15 AM -5:45 PM. The Information Technology Association of America (ITAA) will host an event titled "2003 National IT Workforce Convocation". Phil Bond, Under Secretary of Commerce for the Technology Administration, will give an address in which he will preview the Secretary's report to congress on IT education and training. See, ITAA notice. For more information, contact Marjorie Bynum at mbynum@itaa.org. Location: Hyatt Arlington Hotel, Arlington, VA.
Day one of a five day meeting of patent officials from nine nations, the EPO, and the WIPO hosted by the U.S. Patent and Trademark Office (USPTO). The meeting will "approve a new blueprint for enhancing the quality of searches and examination for patent applications filed under the provisions of the Patent Cooperation Treaty (PCT)". See, USPTO release. Location: USPTO, Arlington, VA. The House will meet at 12:30 PM for morning hour and 2:00 PM for legislative business. It will consider several non technology related items under suspension of the rules. Votes will be postponed until 6:30 PM. See, Republican Whip Notice. 9:30 AM. The Senate Commerce Committee will hold a hearing titled "Media Ownership (Video Markets)". The witnesses will be William Shear (General Accounting Office), James Robbins (P/CEO of Cox Communications), Charles Dolan (Chairman of Cablevision Systems Corporation), Gene Kimmelman (Consumers Union), James Gleason (P/COO of CableDirect), and Leo Hindery (Ch/CEO of YES Network). Location: Room 253, Russell Building. TO BE DECIDED WITHOUT ORAL ARGUMENT. 9:30 AM. The U.S. Court of Appeals (DCCir) will hear oral argument in Davis Broadcasting v. FCC, No. 02-1109. 4:00 PM. The House Judiciary Committee's Subcommittee on Crime, Terrorism, and Homeland Security will meet to mark up HR 21, the "Unlawful Internet Gambling Funding Prohibition Act". The event will be webcast. Press contact: Jeff Lungren or Terry Shawn at 202 225-2492. Location: Room 2141, Rayburn Building. TIME? The U.S. International Telecommunication Advisory Committee (ITAC) will meet to discuss the International Telecommunication Union (ITU) Study Group 16 meeting to be held in Geneva from May 20 to May 30. See, notice in the Federal Register, April 18, 2003, Vol. 68, No. 75, at Pages 19247 - 19248. DEADLINE EXTENDED TO MAY 16. Deadline to submit reply comments to the Federal Communications Commission (FCC) in response to its Notice of Inquiry (NOI) [MS Word] regarding "Additional Spectrum for Unlicensed Devices Below 900 MHz and in the 3 GHz Band". Unlicensed devices would include, among other things, 802.11. See, notice of extension [PDF]. 10:00 AM. The House Judiciary Committee will hold an oversight hearing titled "Direct Broadcast Satellite Service in the Multichannel Video Distribution Market". The hearing will be webcast. Press contact: Jeff Lungren or Terry Shawn at 202 225-2492. Location: Room 2141, Rayburn Building. 5/1. Jonathan McHale and other representatives of the Office of the U.S. Trade Representative (USTR) spoke at a luncheon in Washington DC regarding the USTR's Initial Offer" [120 pages in PDF] to the World Trade Organization (WTO) regarding opening access to telecommunications, information, and other services. Basic Telecommunications Services. The U.S. proposes, for "basic telecommunications services", no limitations on market access for "Cross-border supply", or for "Consumption abroad". For "Commercial presence", the U.S. proposes no limitations on market access, "other than Ownership of a common carrier radio license", in which case, for "indirect" ownership, there would be no limitation, while for "direct" ownership, there would be the following limitation: "May not be granted to or held by (a) foreign government or the representative thereof (b) non-U.S. citizen or the representative of any non-U.S. citizen (c) any corporation not organized under the laws of the United States or (d) U.S. corporation of which more than 20% of the capital stock is owned or voted by a foreign government or its representative, non-U.S. citizens or their representatives or a corporation not organized under the laws of the United States." Finally, for "Presence of natural persons", the U.S. proposes the following: "Unbound except as indicated by horizontal commitments". The U.S. proposes, for "basic telecommunications services", no limitation on national treatment, except for "Presence of natural person, for which the U.S. proposes "Unbound except as indicated by horizontal commitments". The U.S. Initial Offer also provides a description of the term "basic telecommunications services". It states, "The transmission between or among points specified by the user, of information of the user's choosing, without change in the form or content of the information as sent or received, as defined in 47 U.S.C. 153. Services can be supplied on either a public or private basis, regardless of the facilities used." The U.S. Initial Offer also includes several "Additional Comments" to the section on basic telecommunications services. It states, first, "Maintain an absence of national government ownership in public telecommunications service suppliers". It also states, "Maintain a national telecommunications regulatory body independent of executive and legislative branches, which is required to employ transparent procedures in developing rules (including notice and comment) and is empowered to enforce regulations through sanctions, including fines and revocation of licenses; and Permit licensed suppliers of basic telecommunications services choice of technology used in the supply of services, subject to requirements necessary to fulfill legitimate public policy objectives." "Ensure that local exchange carriers, provide dialing parity;"
"Maintain measures prohibiting local exchange carriers from imposing unreasonable or discriminatory conditions or limitations on the resale of public telecommunications services;"
"Ensure that local exchange carriers provide access to poles, ducts, conduits and rights of way at just and reasonable rates and on non-discriminatory terms and conditions to competing basic public telecommunications service suppliers." For information services, the U.S. proposes no limitations on either market access or national treatment, for either cross-border supply, consumption abroad, or commercial presence. However, for presence of natural person, it states, "Unbound, except as indicated in the horizontal section". Other Communications Services: Cable, Satellite, and Broadcast. Finally, the Initial Offer next addressed "Other Communications Services", which it described as "Cable services provided over cable systems, as defined in 47 U.S.C. 522 and 47 U.S.C. 522", "One-way satellite transmission of DTH and DBS television services and of digital audio services", and "Radio and Television Broadcast Transmission Services". It proposes no limitations on market access for cross-border supply, or for consumption abroad. However, for "commercial presence" it proposes no limitations, "except that a single company or firm is prohibited from owning a combination of newspapers, radio and/or TV broadcast stations serving the same local market. Radio and television broadcast licenses may not be held by: a foreign government; a corporation chartered under the law of a foreign country or of which more than 20 per cent of the capital stock is owned or voted by non-US citizens; a corporation chartered under the laws of the United States that is directly or indirectly controlled by a corporation more than 25 per cent of whose capital stock is owned by non-US citizens or a foreign government or a corporation of which any officer or more than 25 per cent of the directors are non-US citizens." Also, for "presence of natural person, it proposes, "Unbound, except as indicated in the horizontal section. In addition, US citizenship is required to obtain radio and television licenses." It proposes no limitations on national treatment for cross-border supply, for consumption abroad, or for commercial presence. For presence of natural persons, it proposes, "Unbound except as indicated by horizontal commitments". Jonathan McHale, and other representatives of the USTR, reviewed the meaning and significance of each of these proposals in detail at the May 1 luncheon. He also described the responses and proposals of other nations, and the USTR's assessment of them. He also answered questions, and received public comments regarding the U.S. proposal from U.S. and foreign parties. Tech Law Journal (TLJ) spoke with the organizer of the event, who asserted that the event was "off the record" for TLJ. Hence, TLJ has not published here any of the statements made by the representatives of the USTR, or any of the public comments made to the representatives of the USTR. See also, TLJ story titled "USTR Submits Proposal to WTO Regarding Trade in Services", March 31, 2003.